You have made the investment on a beautiful new pool but you don’t want to look at the pool equipment. What is a homeowner to do? Hide that equipment with landscaping of course! We love to find these resources for you and get you thinking about what improvements you want to make next spring so that your pool is ready for swim season! Once again, we found ourselves at intheswim.com. Swimming pools are beautiful: sparkling blue water, and inviting pool decks can be just as aesthetically pleasing to look at as they are fun to swim in. Pool equipment, not so much. 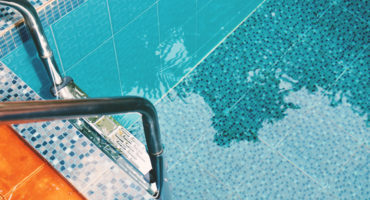 PVC plumbing, pumps, filters and heaters are obvious necessities for all of us pool owners but any pool owner can attest that we would rather see the results of the equipment without the constant reminder of their presence. I’ve tackled the topic of Pool Equipment Enclosures in a previous blog with a nuts and bolts approach to building walls around pool pump and filters. Today we approach hiding pool equipment with a greener approach: with Plants. There are a number of ways to use the landscape or enhance the landscape to hide pool equipment and redirect sound from noisy pool pumps. A combination of grading and planting can be used to block the view and the sound. One of the oldest landscaping tricks is to sculpt the land to make it more pleasing to the eye. 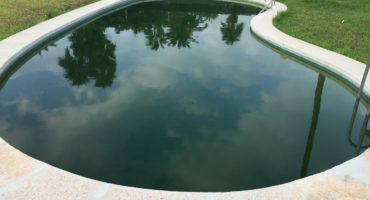 Whether an entire dump truck full of fill dirt, or a few yards of topsoil, you can make a nice cerrito, or small hill to hide the pool equipment, and deflect pool pump noise. Adding a berm or mound in front of the equipment won’t work for everyone, you need to have extra space, a big wheelbarrow and a strong back. Shown here is a delivery of 5 yards of topsoil, but just 1 yard of topsoil can be used create a 3′ x 8′ berm about 12″ high, that can be planted with grasses or bushes. Tall native grasses like Karl Reed Forester can be an affordable solution to hiding your pool equipment area. Many grow tall enough to thoroughly screen the largest of pool heaters, and they are relatively low maintenance. The most common of all the tall grasses. Maiden Grass has a narrow green leaf blade with a white stripe in the middle. Maiden can grow up to 5’ or 6’ tall and up to 5’ wide and each year that it grows back it grows a little bit bigger. It plumes in late September in a nice shade of maroon and then fades to silver. Maiden grasses little sister is Morning Light. If your space isn’t big enough for a robust grass like Maiden Grass, Morning Light is very similar only much smaller! They take a few years to come in, faster with water and fertilizer. Prune them back in the early spring to remove dead wood, and they’ll push out new shoots in place. Plume Raven is similar to Pompas grass or Fountain grass, but is more hardy for colder winter climates. Plume Raven has a wider blade than Maiden and is a lighter shade of green but it grows much taller, up to 8’ tall in just a few years. Puts forth later summer growth, and can actually jump-up another 4’ when displaying its purple plumes in September. The blades of Zebra Grass are wider than Maiden and noticeably a brighter shade of green. It can grow 5’ to 8’ tall and up to 6’ wide. It has a light pink plume appears in late August. It’s a bit floppier than the previously mentioned grasses but can add a unique accent. An alternative to Zebra Grass is Japanese Silver Grass. It’s much lighter in color but similar in size. Other notable ornamental grasses are Switch Grass, Giant Miscathus, Ravenna Grass, and Giant Feather Grass. Most ornamental grasses are hardy for zones 5-9 (which is most of the US), and can be cut back and mulched-over for winter in northern zones 3-4. The big brother of grass, bushes are a step up from tall grasses and can serve as a much denser natural screen. Evergreen bushes work year round and many bushes offer the versatility of thriving in large planters giving you opportunities to flash your style. Ask at your local nursery, some bushes can get messy and produce debris that lands in your pool, and others can grow too big, too fast. So there you have it America! If you want to soften the backyard, add bushy bushes and fluffy grasses to hide your pool equipment and reduce pump noise. Just be sure to give lots of room for the plants to grow, without blocking sunlight and air flow to the equipment. Or if needed, grasses and bushes can be easily pruned, any time of year. If you need further assistance with questions on how to help your backyard look nicer or are in need of a pool renovation, be sure to contact us!